Teacher, preacher, author Bernie Le Battie empowers families by strengthening marriages and focusing on values.The leading pastor of Family Restoration Ministries, a church passionate about the restoration of families, Bernie Le Battie ministers to the nations both nationally and internationally via radio, television, seminars and conferences. A family man, Bernie has been married to his wife, Cathy, for 42 years, and the couple have three daugthers and nine grandchildren. 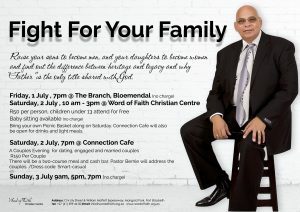 Having founded Bernie le Battie Family Ministries in 2012, Bernie is a spiritual father to many prominent people like Vanessa Goosen,pastors and five-fold ministries. He believes that fathers have become an endangered species and are sorely needed in this time of fatherlessness. Arise 2016: From Invisible to Invincible! If you are viewing this site on a mobile device, click here to see the Arise June 2016 Newsletter. 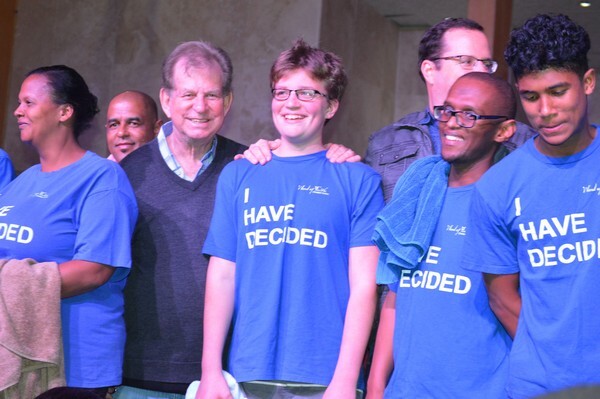 For photos from our Mass Baptism event this Sunday, see the gallery below. Child Dedication is a special occasion where parents express their desire to raise godly children and we express our commitment as a church to empower parents in that calling. 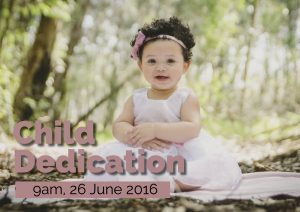 The next Child Dedication will be taking place on the 26th of June. Register your child for this special event at the information counter before or after the services, or call our offices to register during the week. 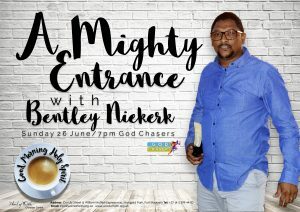 This week At God Chasers we continue the Good Morning Holy Spirit series with Bentley Niekerk and a message titled A Mighty Entrance. 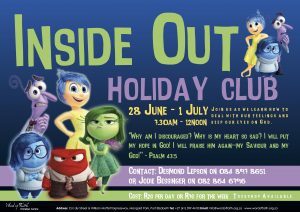 Inviting all the 6 to 13 year olds to join us at the Inside Out Holiday Club! 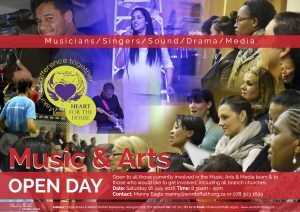 Running from the 28th of June until the 1st of July, we’ll be learning how to deal with our feelings and keep our eyes on God. Join us this holiday at a cost of R20 per day or R70 for the whole week. 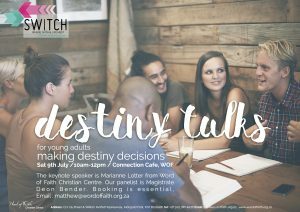 For more info, contact Desmond or Jodie at the church office. 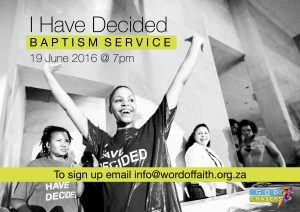 Join us this Sunday June 19th for the God Chasers “I Have Decided” Baptism Service at 7pm.